Sweet Wormwood is an annual plant that produces a single stem with alternating fern-like leaves, yellow flowers and a camphor scent when picked. The plant can grows up to 2m tall, with an average leaf measuring between 2cm – 5cm in length. Sweet Wormwood can be easily seen growing wild in waste-land, parks and along railway tracks and roads. 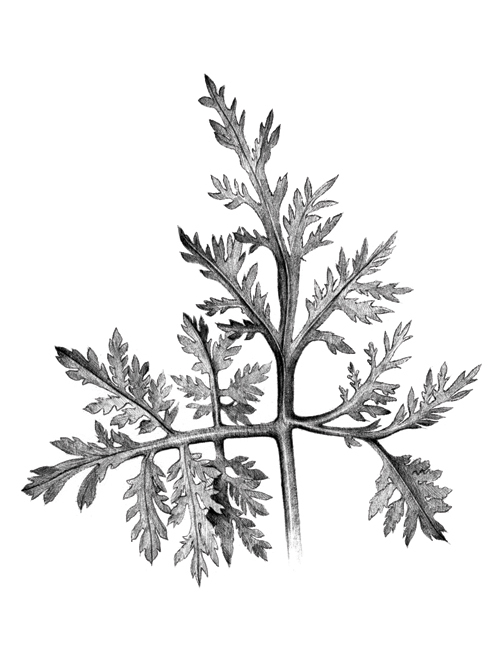 Traditionally women have used several species of the genus Artemisia to treat reproductive ailments. The name of the genus comes from the Greek goddess, Artemis, known to help women during childbirth1. Do not used if you are pregnant or breastfeeding. **In the treatment for malaria the W.H.O recommends the use of the Artemisin based drug rather than the herbal preparation. Skin contact with the plant can cause dermatitis or other allergic reactions in some people. The pollen is extremely allergenic. The information provided here is only intended to augment people's awareness and knowledge of the properties and uses of some plants. This information is not intended to substitute advice from a physician and is not a substitute for professional medical care. The authors do not recommend collecting and using wild plants from an urban environment as these can be contaminated by several types of pollutants that are harmful to human health. Although references are provided and information has been compiled with care, errors may be present. The remedies listed here should not be used without prior consultation with a qualified healthcare professional. The authors are not responsible for any adverse effect or consequences resulting from the use of the information published in this website. Hatfield, G. Hatfield’s herbal. (Penguin/Allen Lane, 2007). Pizzorno, J. E. & Murray, M. T. Textbook of Natural Medicine. (Elsevier Health Sciences, 2012). Hoffmann, D. Medical Herbalism: The Science and Practice of Herbal Medicine. (Inner Traditions / Bear & Co, 2003). Krishna, S., Bustamante, L., Haynes, R. K. & Staines, H. M. Artemisinins: their growing importance in medicine. Trends Pharmacol. Sci. 29, 520–527 (2008). Herbal Drugs: Ethnomedicine to Modern Medicine: Ethnomedicine to Modern Medicine. (Springer, 2008).